The president said the two nations were speaking directly ahead of planned talks in late May or early June. 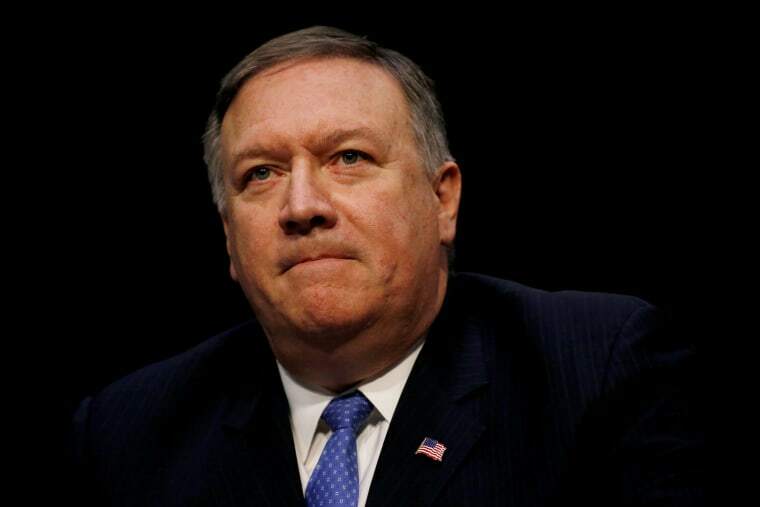 WEST PALM BEACH, Fla. — CIA Director Mike Pompeo made a top-secret trip to North Korea to meet with Kim Jong Un on behalf of the Trump administration. The clandestine mission came soon after Pompeo was nominated to be President Donald Trump's next secretary of state. It was first reported by The Washington Post. Trump confirmed the trip in a tweet early Wednesday. The CIA and the White House both declined to comment when contacted by NBC News on Tuesday. "The administration does not comment on the CIA director's travel," White House press secretary Sarah Huckabee Sanders said. Pompeo, a former Tea Party congressman from Kansas, has yet to be confirmed by the Senate as secretary of state. He was seen in the Oval Office with Trump during a meeting with a South Korean delegation at the White House last month. During his confirmation hearing last week, Pompeo told the Senate Foreign Relations Committee that "no one is under any illusions" that the planned summit between Trump and Kim will achieve a comprehensive agreement on the denuclearization of the Korean Peninsula. Trump said earlier Tuesday that U.S. officials are holding direct talks with the North Korean government at "extremely high levels" ahead of his planned meeting with Kim. He did not elaborate on who was taking part in the meetings or whether the meetings included Kim himself. Speaking at his Florida beach resort ahead of bilateral meetings with the prime minister of Japan, Shinzo Abe, Trump confirmed that the two governments are speaking directly, acknowledging extraordinary progress in establishing some of the most sustained communication between the two nations in over half a century. "We have had direct talks at very high levels, extremely high levels with North Korea," Trump told reporters. "And I really believe there is a lot of good will, lot of good things are happening." "Ultimately it's the end result that counts, not the fact that we're thinking about having a meeting or having it," he added. U.S. officials say North Korea is among the topics that will dominate the two-day summit with Abe and his delegation. Last month, following a visit by South Korea's national security adviser to the White House, Trump decided to accept an invitation by the reclusive North Korean leader to meet face-to-face to discuss denuclearization. However, earlier this year, South Korea made some breakthroughs with its warring neighbor after a series of meetings and discussions that resulted in North Korea sending athletes to compete in the Winter Olympics in South Korea. Athletes from the two countries entered the Olympic arena in Pyeongchang under a unified flag, signaling the potential for warmer ties. Shortly before Trump met with Abe on Tuesday, news of another potential breakthrough emerged, as Bloomberg News reported that the leaders of North Korea and South Korea are in talks to end the war between the two nations. No peace treaty has been signed to replace the 1953 armistice that ended the Korean War. The increasing isolation of North Korea over the decades, plus its pursuit of uranium enrichment, has been a great source of concern for countries in the region, including Japan. Trump said that the two Koreas "have my blessing" to end the ongoing war. Abe said Trump had applied “maximum pressure” on North Korea, adding that he would "like to commend Donald’s courage” in agreeing to meet with the North Korean leader. Trump said the meeting is on track for late May or early June, and that the two sides are discussing five potential sites for the meeting, although he didn't elaborate. But he offered a disclaimer that if things don't go according to plan, the plans could be aborted. "We’ll see what happens," he said, saying it's possible that the meeting would never take place. "But it's a great chance to solve a world problem."